The Guest House has been totally re-furbished to meet the standards necessary for a first class bed and breakfast. Room 1 Twin bedded room with views over the front garden, flat screen sat-view tv, tea/coffee making facilities, blind for privacy/sun screen and decorated in neutral shades with a purple theme. Fully tiled en-suite with shower, window and extractor fan for ventilation. Room 2 Twin bedded room with views over the front garden, flat screen sat-view tv, tea/coffee making facilities, blind for privacy/sun screen and decorated in neutral shades with a green theme. 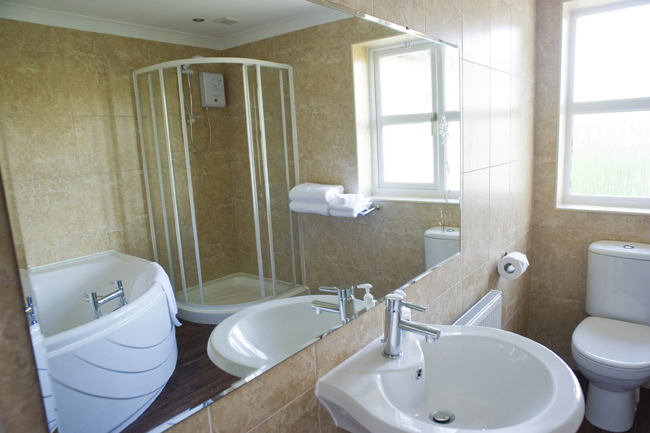 Fully tiled en-suite with bath and shower, window and extractor fan for ventilation. Room 3 Dual aspect family room with twin beds and day bed with guest bed below, flat screen sat-view tv, tea/coffee making facilities, blind for privacy/sun screen and decorated in neutral shades with a blue theme. Fully tiled en-suite with shower, window and extractor fan for ventilation. A travel cot is available on request. Room 4 Twin bedded room with views over the front garden, flat screen sat-view tv, tea/coffee making facilities, blind for privacy/sun screen and decorated in neutral shades with a burgundy theme. Fully tiled en-suite with shower, window and extractor fan for ventilation. 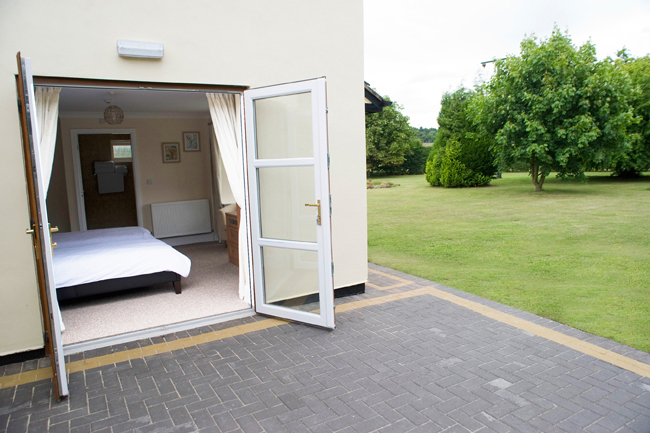 Room 5 Dual aspect twin bedded room with views over the front garden and patio doors opening onto the disabled parking bay for easy access. Flat screen sat-view TV, tea/coffee making facilities and decorated with a brown/beige theme. Fully tiled wet room with grab rails (shower stool available on request) window and extractor fan for ventilation. 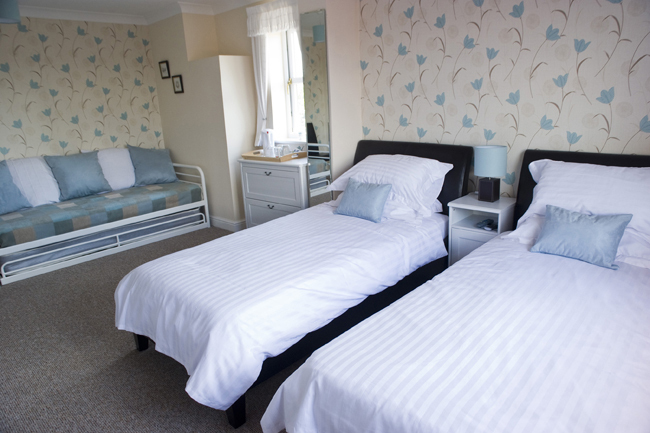 Room 6 is a single room although it has a double bed, with a view of the front garden. It has a flat-screen TV, tea/coffee making facilities and decorated in a green/beige theme. Fully tiled en-suite with shower and extractor fan for ventilation. 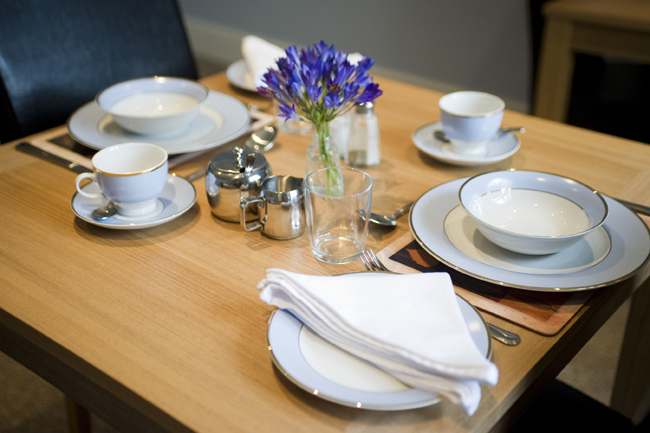 Decorated in pale blue with light oak effect dining tables and brown leather chairs guests can enjoy breakfast at a table for two or these can be re-arranged to suit larger parties. Tables are complemented with blue and white china and cotton napkins. A highchair is available on request. This room is available to use throughout the day/evening to avoid food being taken into bedrooms. There are several benches and a patio with table and chairs for guest use at any time. Smoking is only allowed outside and there is a covered porch for use on wet days. 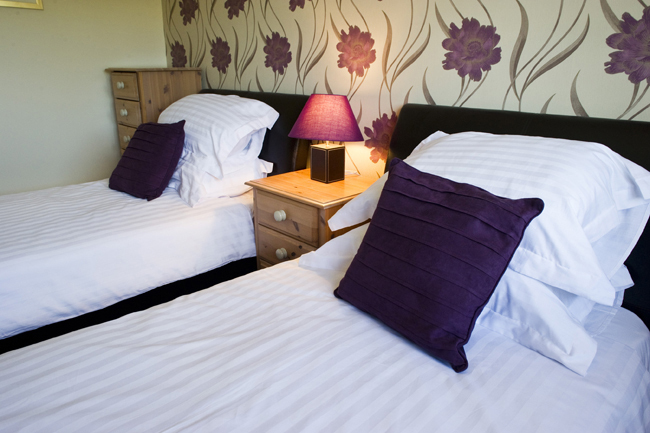 All rooms offer free WIFI broadband Internet access.